I have then used 'Molding Paste' and a 'Newsprint' stencil from Celebr8 to give some texture to my background. 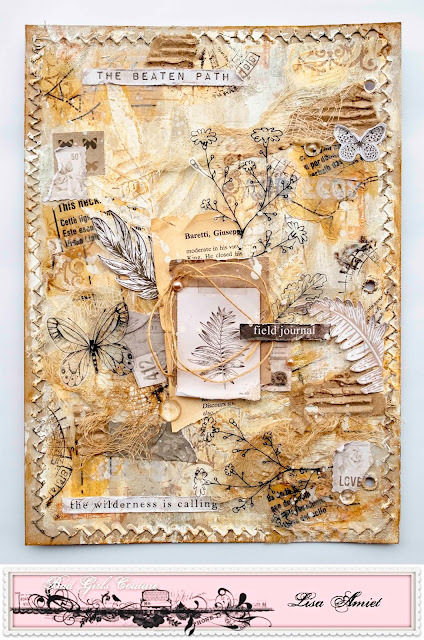 I have used 'Matte Gel Medium' to adhere my paper pieces, from the Dear Diary collection from Mintay Papers. I have also used some chipboard pieces from my fave 2Crafty Chipboard. I have given them a white crackle finish, I have also slightly inked them. I have used a mix of stamps from the Air Mail & Northern Lights collections, on my background papers. I have also used a couple of the flourishes from the 'Flourish Adornment Set 4' in among my layers. I have also used one of the 'Fancy Clock Hand Set 2' on the smallest clock face. For my title I have used one of the words from the 'Fine Word Set 2' along the bottom of my photo matt. There is lots of fussy cutting in this layout. I have cut out all of the foliage, to build up the centre piece. I have added foam tape to the back of the top layer, for dimension. A fairly simple photo mat using the patterned papers, stickers from the Sticker Book. I have added a Curio, next to my sentiment. And finally I have used one of the sentiments from the patterned papers. 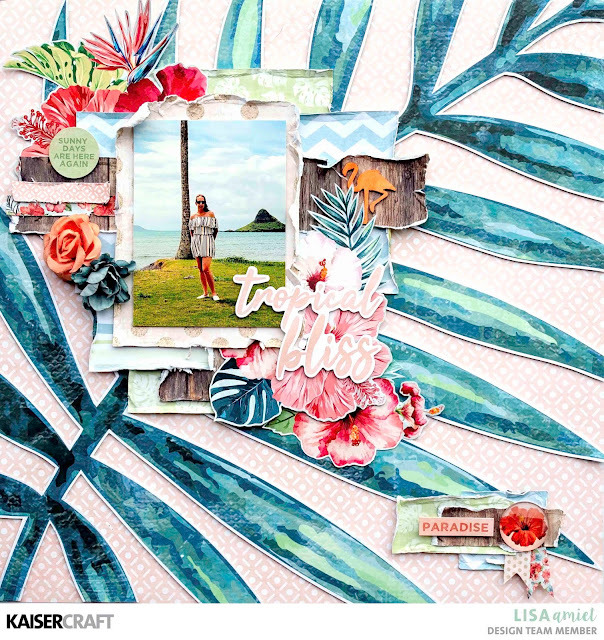 PAPERS: PARADISE FOUND Collection: P2694 Tropic Vibes, P2695 Palm Trees, P2697 Ocean Air, P2698 Chase the Sun, P2699 Balmy Nights, P2701 White SandsKC PRODUCTS: SK802 Sticker Book, CR202 Curios, IP757 Ink Pad Black. Hello! 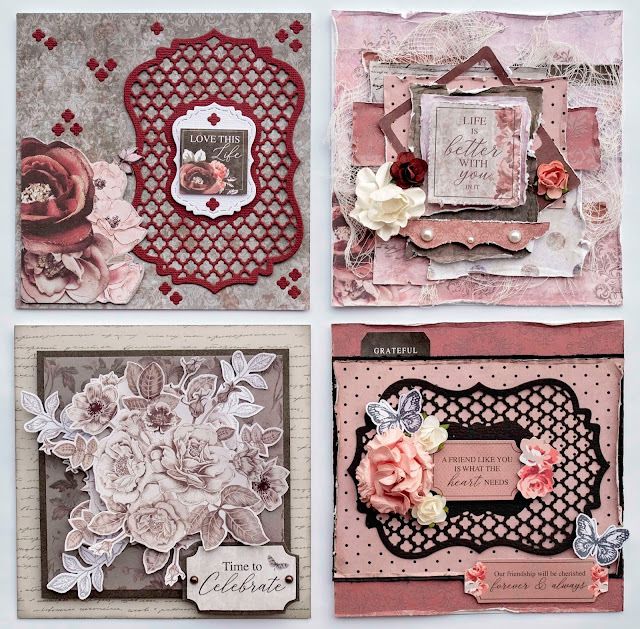 Today I'd like to share a set of 4 cards that I have created for Kaisercraft using their Rosabella Collection. Using some of the gorgeous gloss papers from the Paper Pad. I have also used the Ornate Layered Bracket Die. A card for any occasion, monochromatic florals and foliage from the collection. For this card I have again used the Bracket Die, but I have also used some of the cut out pieces adhered to the card. I have also used stickers from the Sticker Book. Lots of layers and some gauze added for texture. I have again gone for lots of dimension on this card. I hope you like what I have created. I will be back soon with some more to share with you. I also have some tips and tricks on different ways to use Matte Gel Medium. I love my matte gel! The first and main way that I use this medium is mixed with my Haute Mess Acrylic Paints. The Matte Gel Medium adds texture to your dried acrylic paints. but you are able to leave texture with brushes or palette knives. but don't fear this is temporary as it dries clear and your colour is the same. For this page I have started with a coat of Haute Mess Clear Gesso. I have built up my paint layers using Matte Gel Medium mixed with Haute Mess Acrylic Paints in natural colours. I have also used the Molding Paste to stencil in some fern leaves. Hello! 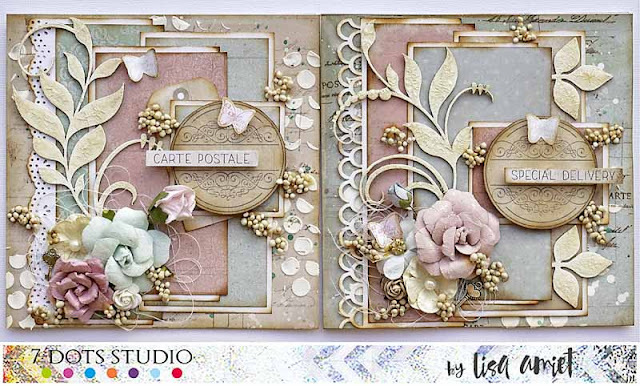 I'm popping in today to share my latest creation for Kaisercraft using their Paradise Found Collection. Perfect for some of my Hawaii photos! 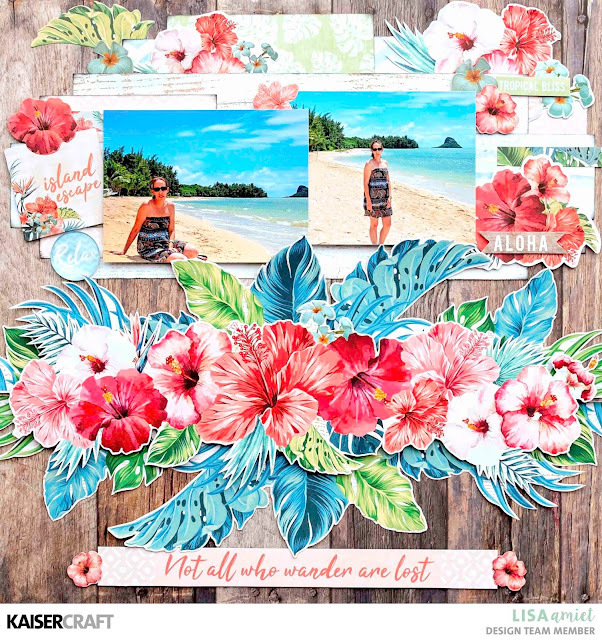 When I received this collection I fell in love with all the gorgeous tropical foliage. I really wanted to use this leaf on the 'Ocean Air' paper. I have fussy cut it out and adhered foam tape to the back of each frond, and have then laid it on the page. I did need helping hands to do this as it can be quite tricky to line up. I have then built up a photo stack with layers of the patterned papers, fussy cut florals and some of the stickers from the NEW Sticker Books. I have also added in some co-ordinating paper blooms. To finish I have used one of the NEW Curios, on a little corner cluster. I hope you like what I have created. You can find the full instructions for this layout HERE.